Now this is really ..... interesting. Part of the whole ethanol boom is the distillers grain that is available after the ethanol is made. This distillers grain has turned into a real boom for the cattle feeding buisness. The cattle feeders might be losing some corn but they are making up for it with the distillers grain. Win, win right? Early research seems to indicate that the distillers grain increases the amount of E. coli in these animals guts. The amount of E coli in animals fed distillers grain was about twice as much as those that were fed no distillers grain. Whether the E coli is from the distillers grain or the distillers grain just helps it grow better is unknown at this point. Now we are talking a food safety issue though. More E coli in the animals means a higher chance that E coli might be in the finished product. Properly handled meat shouldn't have any E coli in it from such a source but the pace meat is handled in the big meat packing plants sometimes gets contaminated whether they like it or not. So this makes ethanol a food safety issue. I'm always talking about the food security issues that ethanol has brought up and now we are seeing food safety issues with it too. Ethanol is going to be with us for a long time. I'm not blind to that. But how important is ethanol to you? How should we as a society deal with the food security and food safety issues that ethanol seems to generate? Are the higher food prices and the increased E coli risk worth putting ethanol in your SUV? Are the higher food prices and the increased E coli risk worth subsidizing the ethanol industry with our tax dollars? All tough questions. I don't know that I have the answers to these questions. Part of the answer might be conservation though. Do you really need that big SUV? Might you get by on a smaller, more fuel efficient vehicle. I went this route with my last vehicle. It isn't the best vehicle for me and my family but the gas mileage made it well worth it to me. More people need to think about conservation. That is part of the long term answer to the energy problems. Ethanol is raising a lot of valid concerns out there in my opinion. How the American people deal with these problems will be very interesting. 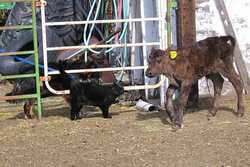 A dog, a cat and a calf. Quite the meeting of the minds. Momma was to busy eating to notice her baby was near these ferocious critters. Taken 3/15/2006.